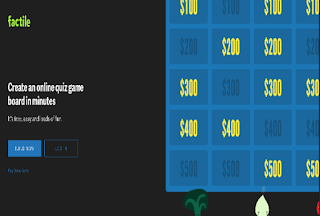 Factile (former Jeopardy Rocks) is an excellent web tool that enables teachers to create multimedia quiz games for their classroom. Using a simple and intuitive gameboard, teachers will get to create engaging quiz games without the need for any coding skills. The process is easy: Open an account with Factile, click on ‘build now’ in homepage then type in your titles and categories. Click on a square to open up the editor for a question and fill in with your content.